In March 2014, James Holden and Floating Points were invited to the Fellah Hotel near Marrakech, to participate in a week-long residency collaborating with the legendary Maalem (Master) Mahmoud Guinia from Morocco’s Gnawa musical tradition. The four tracks you see before you are the product of Holden and Floating Points’ makeshift open-air recording sessions by the hotel pool with the Maalem Mahmoud Guinia and his band, featuring the Maalem on his three-stringed guembri instrument and lead vocals and accompanied by the trio of Guinia’s brother-in-law and two sons who provide the vocal chorus response and complex krakeb and clapping percussive rhythm cycles that characterise the Gnawa tradition. Presented as a souvenir of that week (complete with 20 page photo essay by Camille Blake) and released in collaboration with Floating Points’ Eglo label, a vinyl release courtesy of Eglo will juxtapose the two contrasting collaborative approaches of Holden and Floating Points on one double A-side 12”. The Border Community digital counterpart meanwhile throws in two bonus digital-only Holden and Guinia improvised live takes, and is set to land in online stores on 20th April 2015, with the 12″ vinyl to follow via Eglo in due course. Floating Points’ ‘Mimoun Marhaba’ began life as a series of prepared Flo’Po loops which the Maalem was invited to jam over via an in-ear monitor, prompting the Guinia group’s rendition of the ‘Marhaba’ (“Welcome”) Gnawa theme. Mixed back home in Sam’s London studio, the poolside singing and clapping recordings were re-integrated with Sam’s virtuosic keyboard performances and reassembled into one trippy, hypnotic, groovy whole – by far the most club-friendly cut here. Holden’s attempts to meld his music with the Gnawa sound meanwhile saw him swiftly repatch his modular synth to enable him to improvise alongside the Guinia contingent’s traditional repertoire, with Sam Floating Points standing in as recording engineer to capture the one-off collaborative performances in a series of live takes. 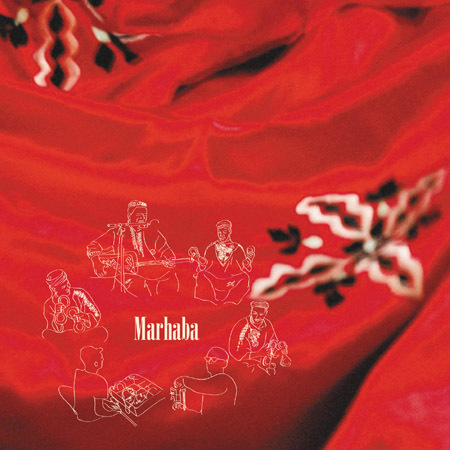 Holden & Guinia’s alternative take on the Gnawa standard ‘Marhaba’ was the very first sketch to emerge, featuring Holden’s own attempt at emulating the distinctive Gnawa beat via a homemade drum machine patch on his modular synth. Their second improvisational experiment – and perhaps the most successful of the three – ‘Bania’ is a magical coming together of two parallel musical evolutions, where Holden’s soaring modular solo drifts in and out of the vocal call-and-response, plucked guembri and relentless krakeb rhythm of the Gnawa traditional. At one point, the metallic clatter of the krakebs naturally falls away to expose the deliciously nuanced in-the-moment interplay between Holden’s undulating synth line and the Guinia-led anthemic vocal refrains, forming a breakdown which is pure trance in every sense of the word, though orchestrated entirely at the behest of the 63 year old Maalem. With the collective sense that in ‘Bania’ they had managed to nail down something rather special, the third and final Holden & Guinia experiment took place under much more relaxed circumstances. Thus a laidback delivery of ‘Tora Tora Torko Lila’ features the subtle yet shrill intervention of a Holden-tweaked modular synth following the decidedly Gnawa-tinged percussive input tapped out by Guinia’s philosophy student son Hamza on the trigger pads of Holden’s midi controller, in a thoroughly modern moment of cultural exchange. Get your copy now from Amazon, Bleep, Norman Records, Piccadilly Records, iTunes, Beatport or Boomkat.